Before a deep landscape of a vast river valley stretching off into the distance, Saint Michael strides into battle against a monstrous army. With his cape blowing behind him and a foot on the back of one demon, Saint Michael waves his sword overhead while fending off another demon with his shield. In the sky above, more demons fly in to attack amid storm clouds. According to the Apocalypse, Saint Michael is the archangel who will banish the devil at the end of time. At the top of the miniature, in a heavenly realm glowing with light, angels hold aloft an empty throne destined for the Messiah at the end of time. The illuminator Lieven van Lathem used the border to amplify the theme of the main scene. Here fantastic beasts frolic; similar to those in the miniature, their confrontations mimic the miniature's battle theme. 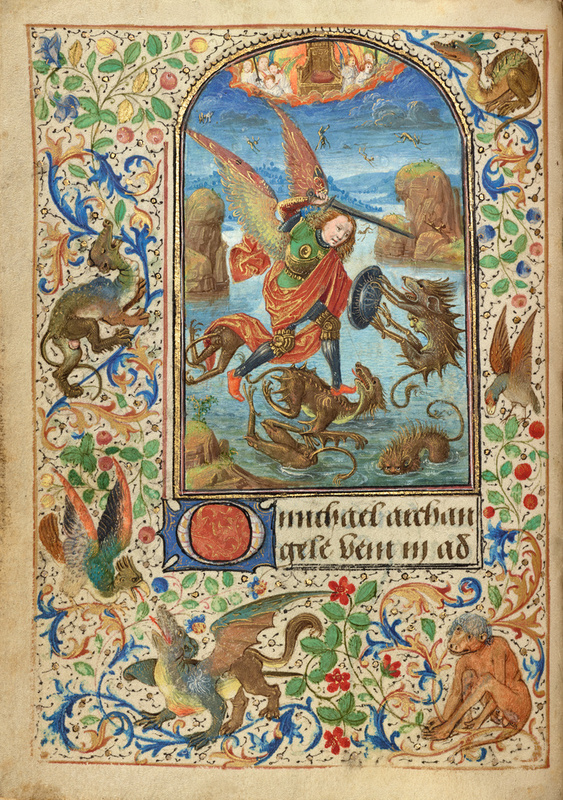 Charles the Bold, duke of Burgundy and a military leader, expressed his devotion to Saint Michael by including a suffrage prayer to him, prefaced by this miniature, in his personal prayer book.